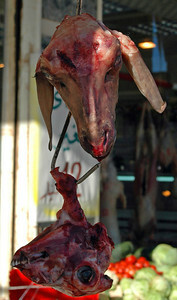 Photographs taken during a February, 2011 antiquities tour of Greek and Roman sites. 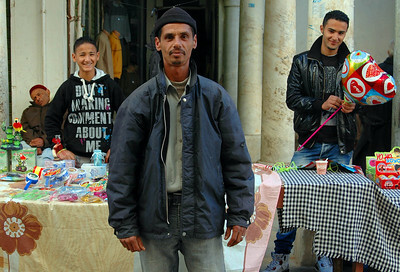 The tour concluded just before violent protests against Muammar Qaddafi broke out in Bengazi and Tripoli. 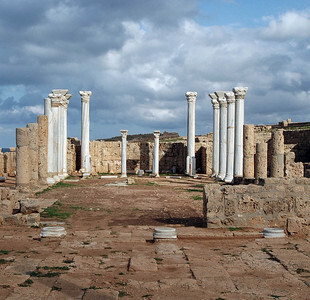 Apollonia: Basilica; Byzantine, 6th century A.D. Apollonia, founded by Greek traders in the 7th century B.C.and dedicated to the god of light and wisdom, was the harbor for nearby Cyrene, about ten miles away in the Green Mountains. 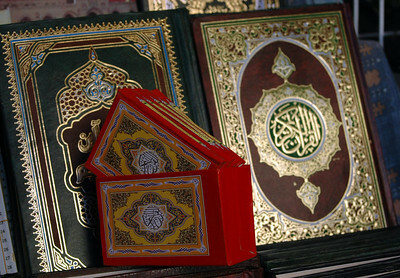 It later came under Roman, and then Byzantine, control. 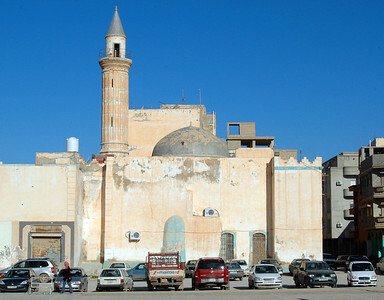 In the Byzantine Christian era, it was known as "the city of churches", of which this was one. Apollonia: Basilica; Byzantine, 6th century A.D.
Apollonia: Palace of the Dux (Duke), detail; Byzantine, 6th century A.D. 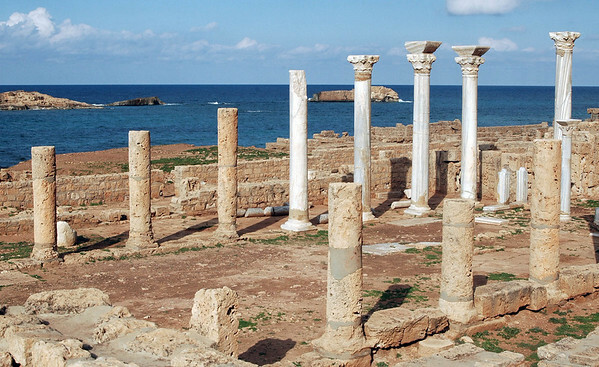 This was once the largest building in Apollonia, with 86 rooms overlooking the ancient harbor. 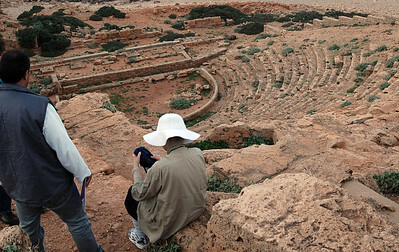 Apollonia: Roman theater, 2nd century A.D.
Benghazi: Mosque, old city Benghazi, in eastern Libya, is the country's second largest city after Tripoli, and was the site of the first anti-government uprising on February 15, 2011. 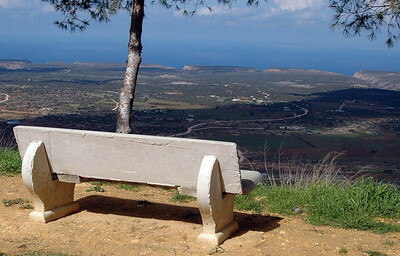 Cyrene (Greek, 3rd/4th century B.C. 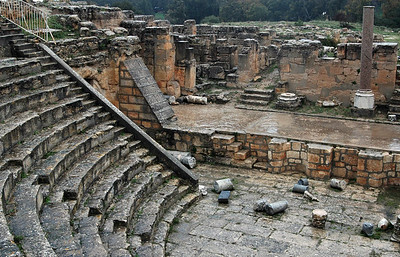 ); looking toward the lower city and Fountain of Apollo Cyrene, settled by Greeks in the 7th century B.C., became one of the largest and most prosperous cities of the ancient world and is designated a World Heritage Site. 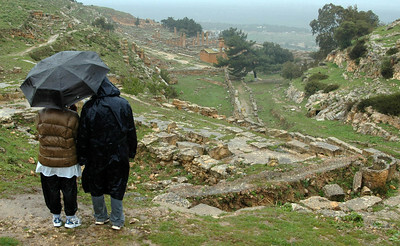 Cyrene: Sanctuary of Demeter and Kore, 4th - 3rd century B.C. Demeter and Kore were Greek fertility goddesses. Newly married women came here to pray for children; pregnant wives prayed for a safe delivery of a male child. 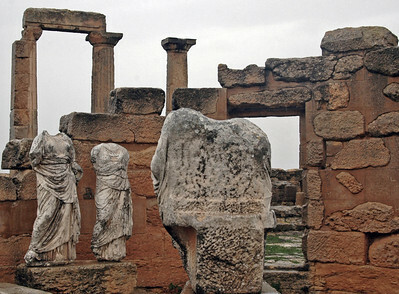 Cyrene: Temple of Zeus; Greek, 5th century B.C. 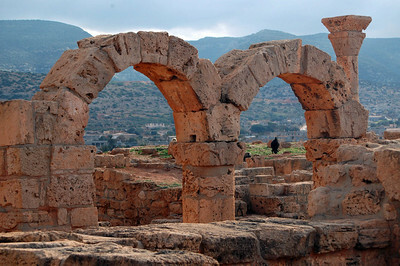 The temple has been undergoing a years-long restoration by Italian archeologists. 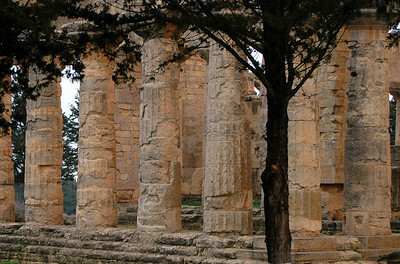 Cyrene: Temple of Zeus; Greek, 5th century B.C. 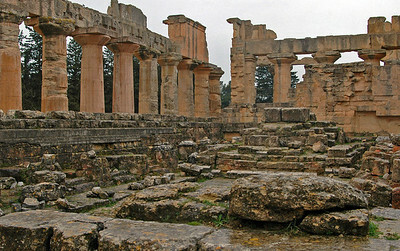 Cyrene:Theater, originally Greek 3rd/4th century B.C. ; then Roman, 2nd century A.D.